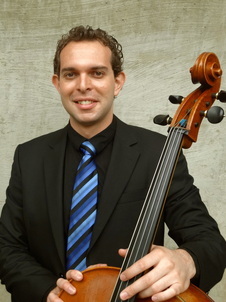 Pablo Issa performs chamber music internationally with The Sound Scape Trio and Cuatro Puntos. He is also the principal cellist of the Hartford Independent Chamber Orchestra. As an educator, Mr. Issa received Long-Term Suzuki Training at the School for Strings in New York City with Pamela Devenport, and completed his pedagogic studies with Carey Cheney and Nancy Hair. Mr. Issa taught at the Community School of the Arts at UConn Storrs, the Suzuki Music School of Westport, and Kids Empowered by your Support in Bridgeport, Connecticut. Currently, he teaches cello and chamber music at The Hartt School Community Division, where he heads the community outreach program and co-coordinates the Adult Chamber Music Program. Pablo Issa holds a Post-High School Graduate Diploma from Interlochen Arts Academy, a Bachelor of Music in Performance from Baldwin-Wallace College, and both a Master of Music Performance and a Graduate Professional Diploma from The Hartt School. His education was made possible thanks to the support of Fundación Arnoldo Schwimmer of Mr. Issa's native country, Bolivia.